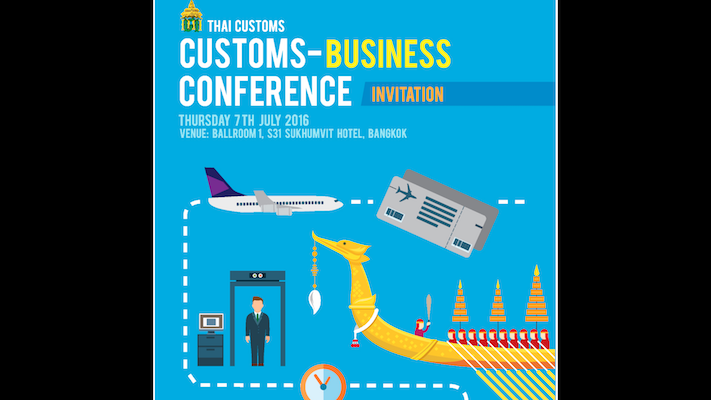 On Thursday 7 July 2016 I had the privilege of attending the first ever Thai Customs – Business Conference, which was held at the S31 Sukhumvit Hotel in Bangkok. This conference, which was attended by around 100 conference participants from a broad range of interested stakeholders including many Chambers of Commerce, represented a refreshing outreach by the Thai Customs Department to the Thailand business community. The recently appointed Director General of Thai Customs, K. Kulit Sumbatsiri, stated very clearly and concisely that Thai Customs needs to adjust and change from being a Tax Collector to become a Trade Facilitator, and no longer be an obstacle to trade and investment. He also indicated in his opening remarks that Thailand can no longer count on customs tax collection as a significant source of revenue, because tariffs are being restructured to increase Thai trade competitiveness. The Thai Customs Department is currently executing its new five year plan, titled “Future Customs 2020.” This plan will see the transformation of the Thai Customs Department to become a trade facilitator for Thailand business activities. National Single Window: This has been discussed for more than ten years, but is now being diligently pursued. The National Single Window will effectively create a “One Stop Shop” for importers, where the Customs Department will be electronically linked to 36 related government agencies in a database, to allow importers to pursue import licenses from relevant agencies such as the Agricultural Department, Ministry of Industry, and even the Ministry of Public Health. The goal is to facilitate prompt and convenient import license approvals. A pilot program involving the five most frequently imported goods will soon be launched. Pre-Arrival System: This is a system to expedite customs arrival formalities. Manifests from air and ocean shipments will be transmitted to Thai Customs six hours in advance of arrival. Thai Customs will analyze the manifests during a 4 hour period prior to shipment arrival, and pre-approve shipments for the Green Line or Red Line channels. The Pre-Arrival Process of Suvarnabhumi Airport is being used as a model. The goal is to expand this system to other airports and seaports based on the success of the Suvarnabhumi model. Authorized Economic Operator Program (AEO): The AEO program is a successor to the previous 1999 Gold Card Scheme and the 2009 Licensed Customs Broker program. AEO was launched in 2013 upon the cancellation of the Licensed Custom Broker program. Today Thailand has 297 AEO Operators, including 147 Customs Brokers and 150 Importers / Exporters. The advantages of AEO include exemption from physical examination except for related laws otherwise stated or in the case of suspicions. Also, AEO members will receive priority for conducting physical examinations when they are required. Thailand is in the process of negotiating reciprocal “Mutual Recognition Arrangements (MRA)” with Hong Kong, Singapore, Malaysia, and S. Korea. Hong Kong and Thailand have already executed an MRA agreement, and a pilot operation will begin later this year. Advanced Tariff Ruling (ATR): This is a service for importers to seek an advance ruling on tariff classification of goods prior to import into Thailand, upon a written request. This will provide certainty with regard to the correct tariff classification for imported goods. An ATR ruling is effective for two years from the date of the ruling, and will be issued within 60 official working days after application. Digital Customs and Customs Mobile Application: The Thai Customs Department is working on a mobile application that will greatly facilitate the importation and customs clearance process. During the conference, the Thai Customs Department officials also provided an update on recent and pending revisions to Thai Customs Laws, some of which are nearly 100 years old. Most noteworthy are incremental changes to the Rewards and Bribes laws, which will limit the size of rewards paid to Customs officials. I very much appreciated the information and vision that was shared by the Thai Customs Department. I am cautiously optimistic that the Thai Customs Department can effectively transform itself into a modern, professional, world-class trade facilitator.